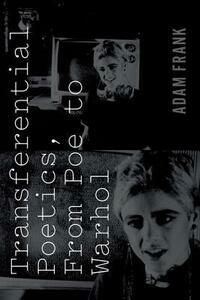 Transferential Poetics presents a method for bringing theories of affect to the study of poetics. Informed by the thinking of Silvan Tomkins, Melanie Klein, and Wilfred Bion, it offers new interpretations of the poetics of four major American artists: Edgar Allan Poe, Henry James, Gertrude Stein, and Andy Warhol. The author emphasizes the close, reflexive attention each of these artists pays to the transfer of feeling between text and reader, or composition and audience- their transferential poetics. The book's historical route from Poe to Warhol culminates in television, a technology and cultural form that makes affect distinctly available to perception. The peculiar theatricality of these four artists, Frank argues, can best be understood as a reciprocal framing relation between the bodily means of communicating affect (by face and voice) and technologies of graphic reproduction.